In India and around the world, poverty is predominantly rural. Development agencies often note that 75 per cent of the world’s extremely poor people — those who earn less than $1.25 a day — live in rural areas. New figures from the 2014 Multidimensional Poverty Index (MPI), which measures overlapping dimensions of deprivation, show that rural poverty rates are even higher in some regions. In South Asia, the MPI in rural areas is 86 per cent — the highest for any region in the world. These figures underscore the fact that sustainable, inclusive rural transformation is essential to improve the lives of the world’s poorest people. The importance of rural livelihoods is also the focus of the International Year of Family Farming in 2014. The year-long UN observance puts a spotlight on the 2 billion people who live on more than 500 million family farms worldwide, working to ensure food and nutrition security for a growing global population. It reminds us of the cruel irony that the people who produce up to 80 per cent of food in some areas are also the ones who often go hungry. The post-2015 development agenda must factor in a further reality: over 70 per cent of poor people now live in middle-income countries. India, for example, is still one of the fastest-growing major economies in the world. Yet according to MPI 2014, it is also home to more than 340 million destitute people — 28.5 per cent of the population — who suffer multiple extreme deprivations. More than half the country’s population is classified as poor. The position of women, both in home and society, is another huge challenge. 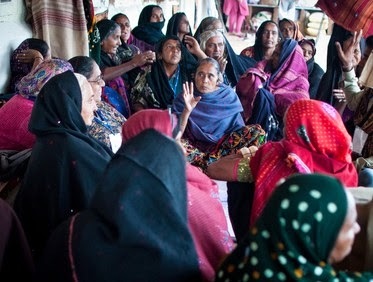 Gender-based violence is endemic in South Asia — as in other parts of the world — drastically limiting women’s freedom to move, work outside home and take advantage of economic opportunities. Eradicating violence against women is fundamental to the eradication of poverty, deprivation and hunger. It is essential in the name of justice, and it allows countries to draw on the strengths and skills of their entire population to make shared prosperity a reality rather than a dream. Today, the official statistics show that South Asia has one of the lowest rates of women’s participation in the overall labour force. At the same time, however, International Labour Organisation data suggest the increasing feminisation of agriculture in the region, as measured by the proportion of women whose main source of employment is farming. According to the ILO, 69 per cent of working women in South Asia were employed in agriculture in 2011, compared with 44 per cent of working men. In addition, women in the region put in longer hours and earn significantly less than men, often working unpaid on family farms or toiling as day labourers. They typically spend a larger proportion of their meagre incomes on household nutrition, health and education. And with men migrating increasingly to urban areas, they are left behind, struggling to manage family farms and care for dependants young and old. In the face of such odds, there is no magic bullet for small farmers, in particular, poor rural women. Existing laws must be enforced, and a raft of new measures taken to secure their entitlements as farmers and equals. In 2011, a Women Farmer’s Entitlement Bill was tabled in the Indian Parliament, but this was not passed. Experience also shows that women themselves hold a key part of the answer if they are given the opportunity, necessary support and access to resources and markets. Among other outcomes, we have seen that women play an important role in conserving agricultural biodiversity, promoting nutrition security and enhancing household incomes. In Kolli Hills of Tamil Nadu, for instance, women have joined together to share millet seeds and revive a hardy, highly nutritious staple crop. With assistance from the International Fund for Agricultural Development and the MS Swaminathan Research Foundation, the women have increased yields by 30 per cent and turned their millet into a marketable brand. Now their products are being distributed across the state and the women are earning income to pay for their children’s education and family expenses. Elsewhere in India, small self-help groups, set up primarily to allow women to save money and provide loans to members, have been shown time and again to empower women in many ways within the broader community. There have been many heartening examples of women’s groups, often working with men, campaigning on critical social issues such as domestic violence and alcohol abuse. Such achievements, however, are not a signal that women can change their lives acting alone. Both gender empowerment and rural transformation must be at the heart of the post-2015 development agenda. Kanayo F. Nwanze is president of the International Fund for Agricultural Development. Dr M.S. Swaminathan is founder and chairman of the M.S. Swaminathan Research Foundation. Mr Nwanze will be speaking about the changing role of women in the economic transformation of family farming at a regional conference organised by MSSRF in Chennai on Friday 8 August 2014.